Posters from English II, Sections 24 and 26, taught by adjunct professor Danica A. Buckley, are now on display in the Library, until March 3rd! 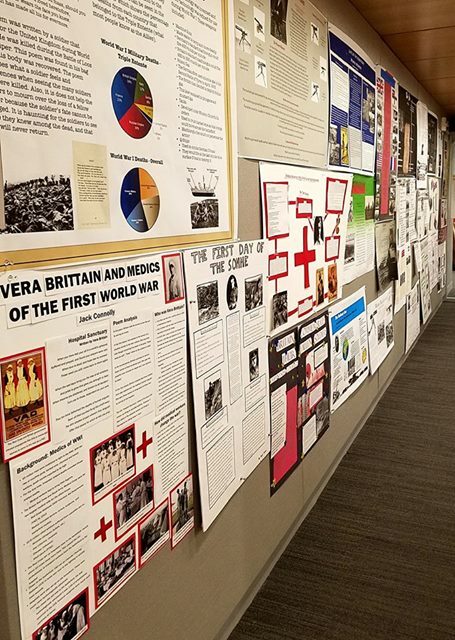 The students read To End All Wars, by Adam Hochschild, chose a WWI poem, and researched an area of interest, culminating in posters, papers, and presentations. The projects are focused on WWI Britain both on the homefront and in the trenches, the suffrage movement, the labor movement, conscientious objectors, medical staff, soldiers, sailors, weapons, etc. Be sure to come by and have a look!